Abstract Body: Last year, we introduced a functional prototype of a portable bluetooth-enabled microstimulator for influencing the behavior of large insects. It was quite big, a bit too heavy, and had a limited number of fixed stimulation frequencies. However, despite these limitations, we still managed to demonstrate bidirectional remote control of a cockroach. We are now happy to report that we have commercialized this invention! By miniaturizing the electronics footprint and expanding the functionality of the firmware, we developed what we feel is a true testbed for experimenting with behavioural perception through microstimulation. The circuit now weighs 3.5 - 4.5 grams (depending on battery size you use), and is appropriately sized for a cockroach (3.2x2.5x0.5 cm). Using your iPhone, you can now finely control the microstimulation parameters (stimulation frequency, pulse-width, and duration) and stimulate two independent output channels (with up to 20mA of current). Since our new bluetooth RoboRoach has an embedded microcontroller, you can now choose to randomize the microstimulation parameters to test adaptation hypotheses. The platform hardware, firmware, and software is 100% open-source. While user-programming of custom applications is possible, it does require the use of a 3rd-party software compiler and a hardware programmer. With this latest version, we are now ready to officially release the RoboRoach into the wild. Come by our poster, see videos and data of the experiments, and give us your thoughts on our design. Lay Language Summary: After four years of research and development, we are proud to be introducing the release of our RoboRoach system. 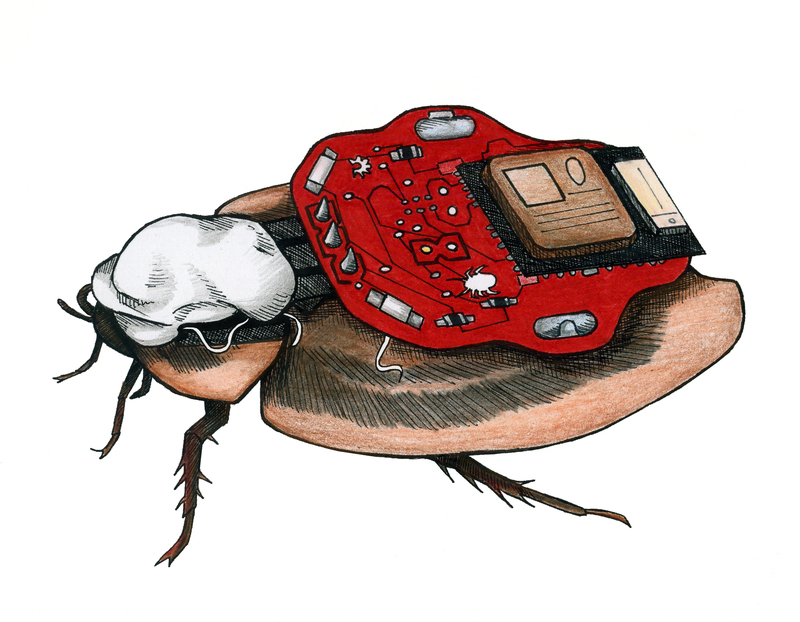 The RoboRoach allows an interested student the chance to remotely control the direction of a living cockroach using their mobile device! Our Roboroach is an innovative marriage of behavioral neuroscience and neural engineering. Cockroaches use the antennas on their head to navigate the world around them. When these antennas touch a wall, the cockroach turns away from the wall. The antenna of a cockroach contains neurons that are sensitive to touch and smell. These neurons convey information back to the brain using electricity in the form of “spikes”. The backpack we invented communicates directly to the neurons via small electrical pulses. The cockroach undergoes a short surgery (under anesthesia) in which wires are placed inside the antenna. Once it recovers, a backpack is temporarily placed on its back.